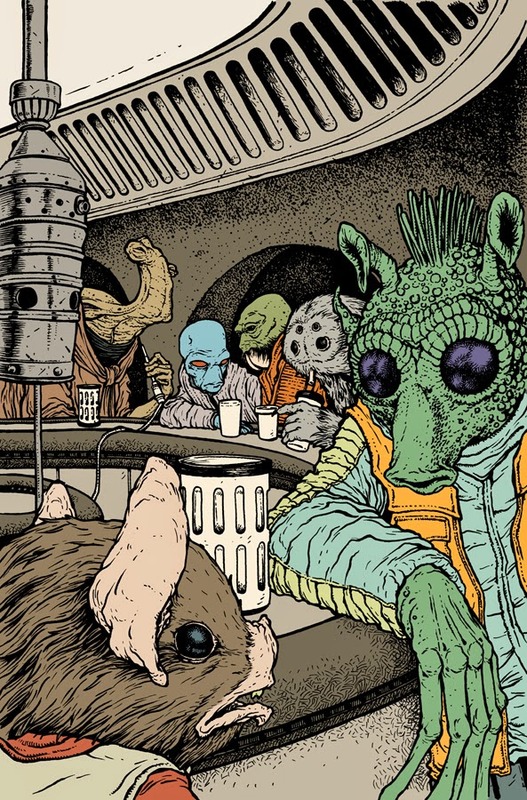 Marvel asked me to do the Newbury Comics store variant for Star Wars # 1! I've done a few official Star Wars cards for Topps in the past (Galaxies 4 base card, Galaxies 5 base card) But this is the first cover I've done for Star Wars. 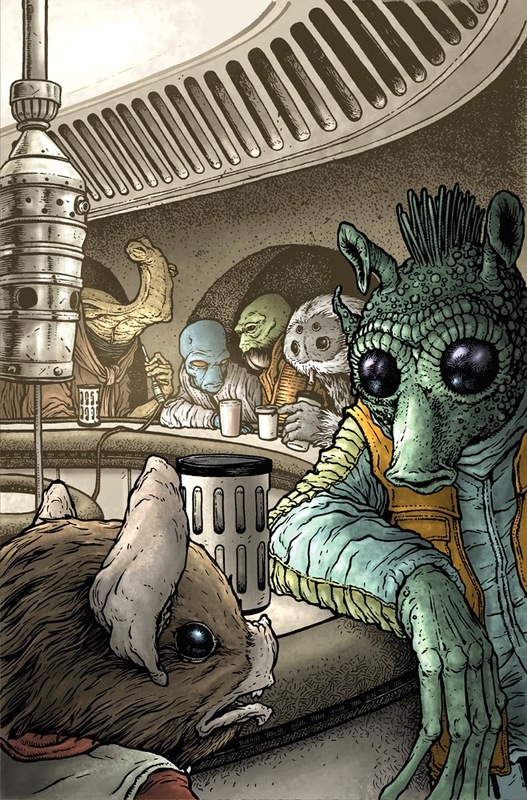 The editor requested a Cantina scene. Well, I dunno if the editor or someone at Newbury Comics requested it...but it was a good call, because I'm terrible at drawing people and especially likenesses. Creatures! I like drawing creatures. 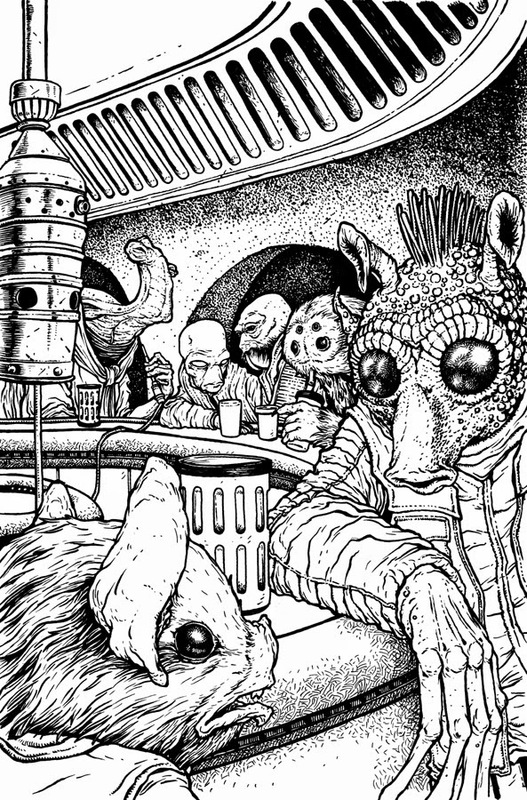 So instead of coming up with a clever scene or interaction in the cantina, I decided just to cram as many alien species as I could in there. 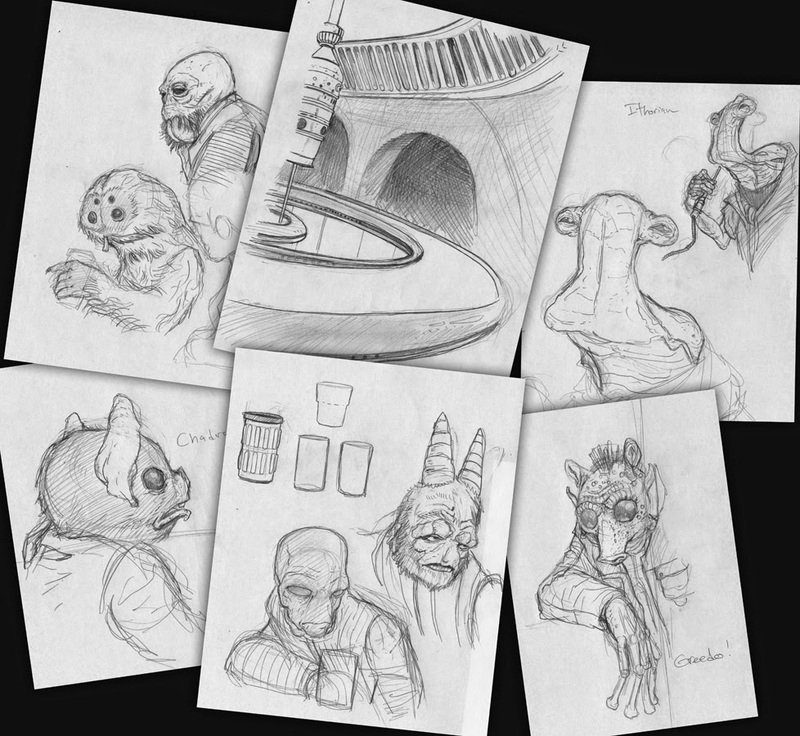 Using Google image search and a few Star Wars guide books I drew these sketches of Greedo, Ponda Baba, Muftak (a Talz), Kabe (a Chadra Fan), Momaw Nadon (a Ithorian), Ohwun De Maal (a Duros), a Gotal (who didn't make the final cut) & The Cantina bar itself (complete with a glimpse of the still-like pieces that became IG-88's head). These were all drawn on sheets of copy paper with a mechanical pencil. I worked up a rough using my sketches. I assembled them all in photoshop, resizing characters, and moving them independently, making rotation adjustments, etc until I had them all fitting in the composition. 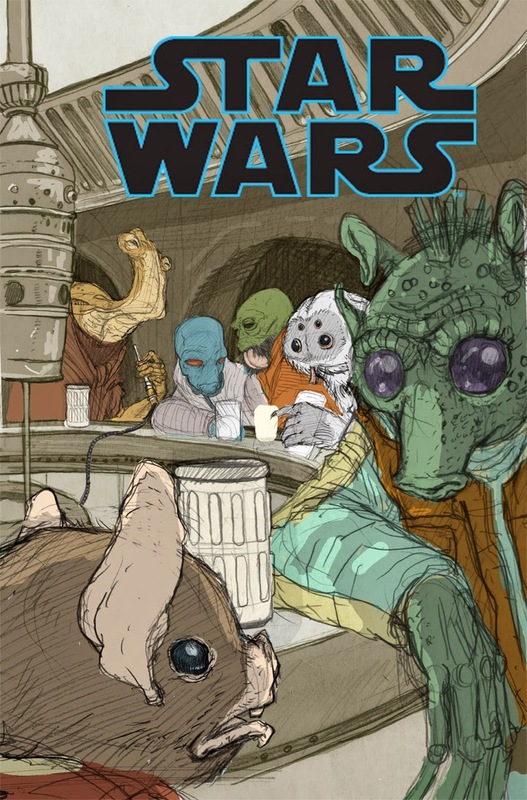 To show both Marvel & Lucasfilm (both of whom must approve the cover) what I envisioned the colors to look like, I slapped down some quick blocky colors and dropped in the logo. The colors also help make sense of which character is which, something that can get hard to read in a hodge-podge collage of grey sketches. This also made me aware to stagger the characters with similar color schemes. After I got the approval to start of the inks, I printed out the above composite/digital rough at 10" x 15" and taped it to the back of a sheet of Strathmore 300 series bristol. On a lightbox I'm able to ink on the bristol surface using the printout as a guide instead of doing tighter pencils. I use Copic Multiliner pens to ink with. In addition to adding greyscale values to the piece, I also want the inks to show texture, he helps me get a better range of greys, but also helps make surfaces feel different from one another so that even if they are the same value, they read as different materials. 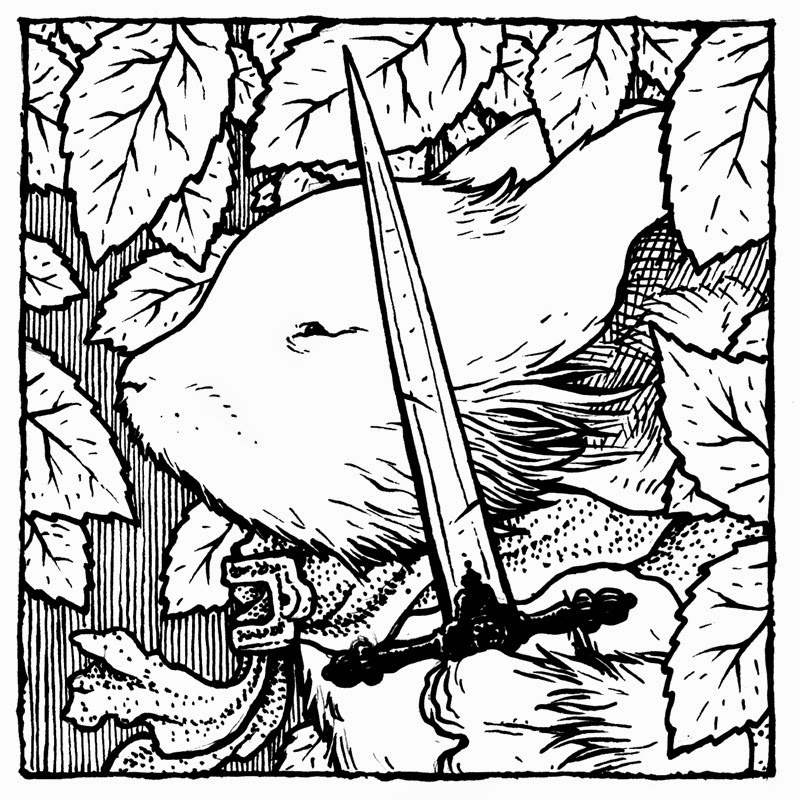 The inks are scanned so I can start on the color process. Most of the colors were easy to pick since I have reference for everything and already roughed in colors for my mockup to send to Marvel/Lucasfilm. I had to make some minor adjustments so the colors all work together, warming up some of the greens and yellowing some of the reds. 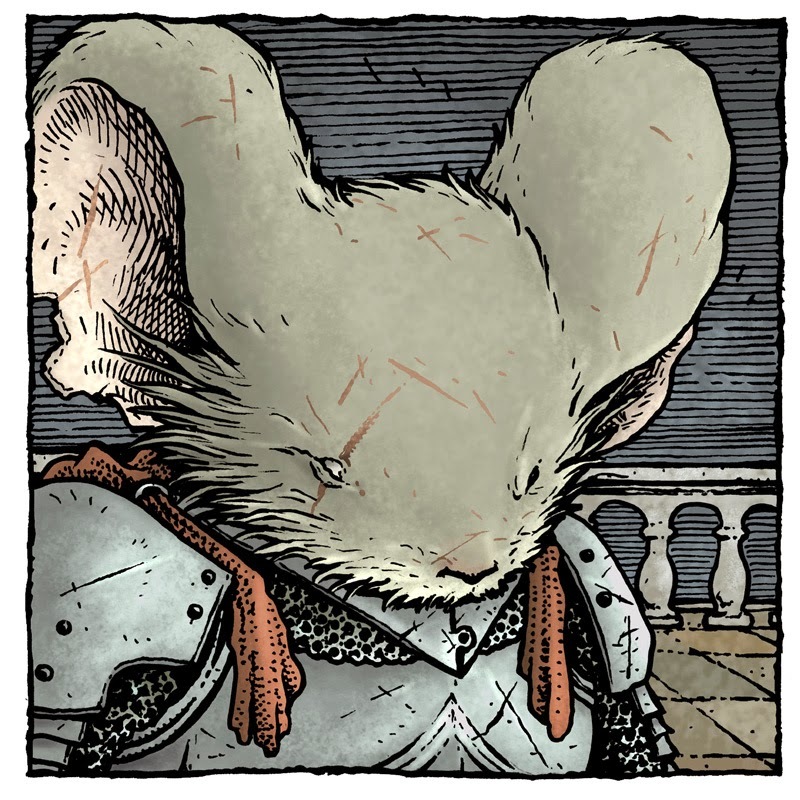 I want to note here, that I didn't 'see' how off the perspective was on the bar-hood where those indents round the corner until I started flatting the colors. I hope the rendering helps a bit as well as covering a great deal of that with the comic's logo. 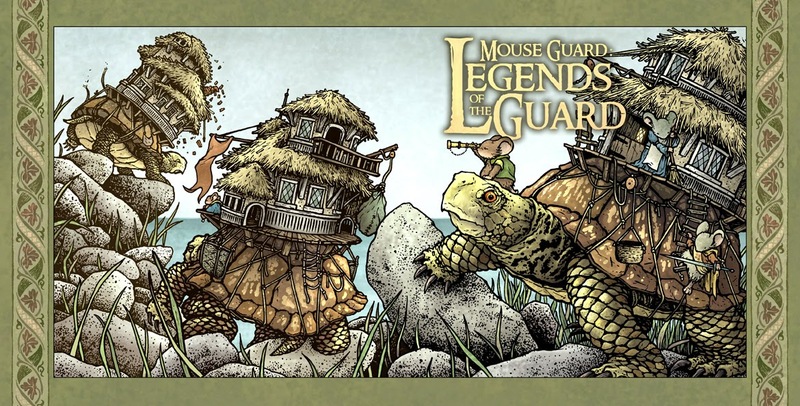 Legends of the Guard Volume 3 is going to be a return to the June Alley Inn where tavern mice sit and tell tales to try and clear their bar tabs. As with the previous two volumes, those tales will be written and drawn by creators I've handpicked. 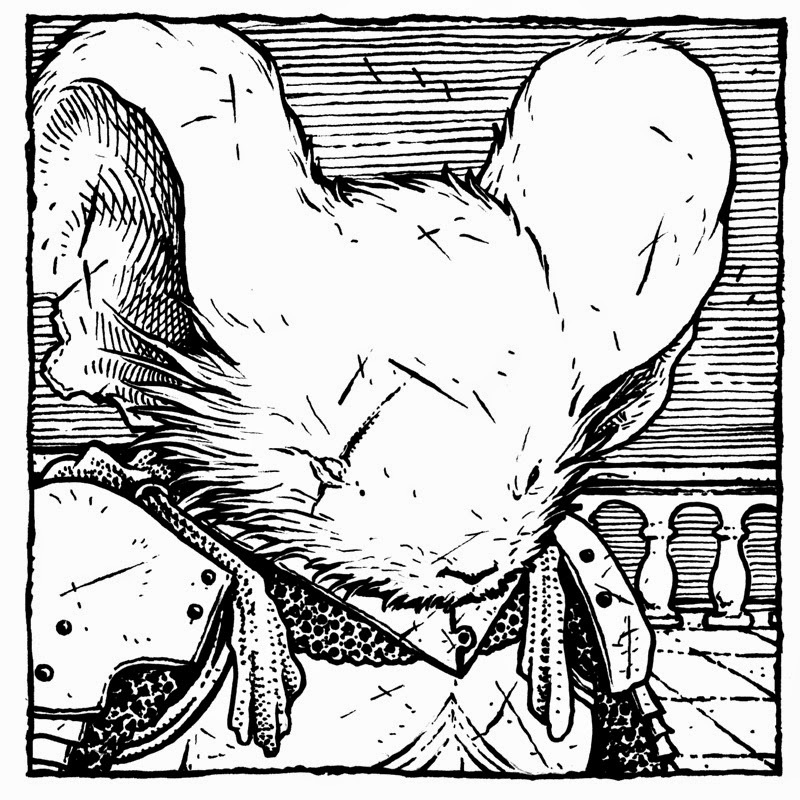 However I'll still be writing and drawing the tavern scenes as well as the covers for the series. For today's blogpost I'll share with you the process for the cover art of issue #1. 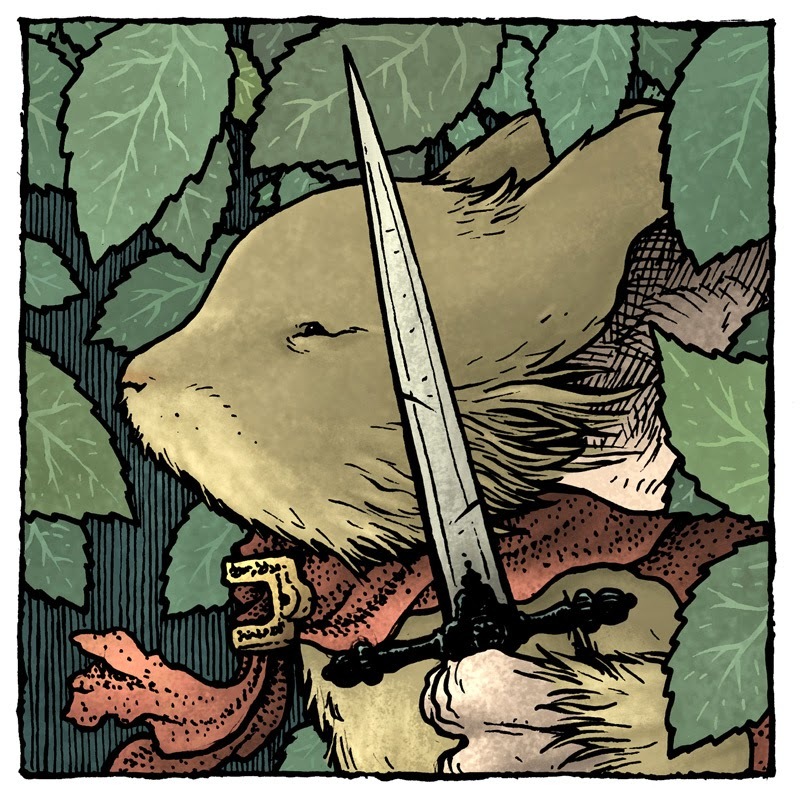 The concept for this piece started with the idea of a larger animal in Mouse Guard perhaps having a mouse city or even just a single dwelling on it's back. 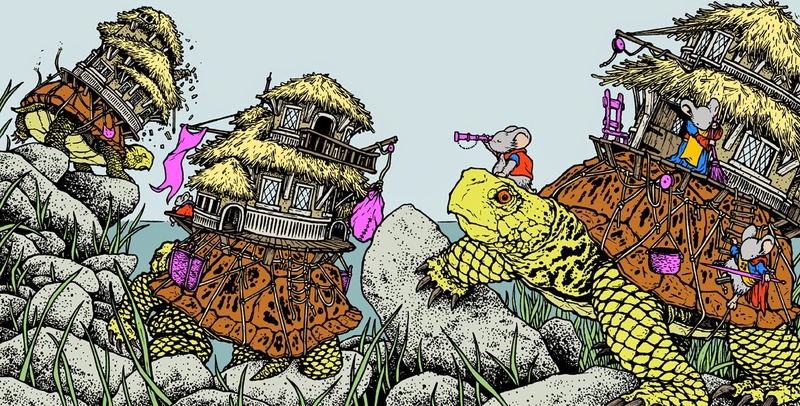 I wondered what animal would be able to carry that load and not risk shaking the whole dwelling apart in it's rapid footfalls or writhing route through the forest: Turtles. 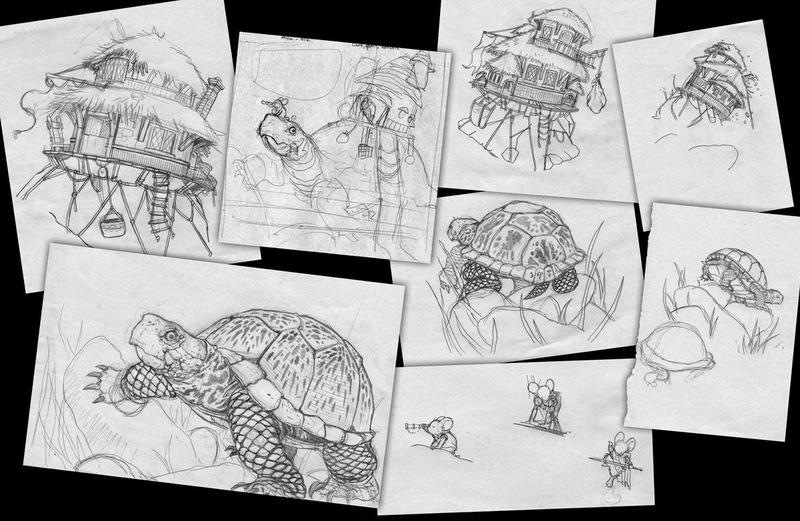 I drew each turtle separately on paper and then on a lightbox and a new sheet of paper, drew houses to match up to their shells. I also drew the inhabitants this way. Over the course of 8 scraps of paper I had the cover assets. I scanned each of those paper scraps, tinted them and reassembled them in Photoshop. This allowed me to make easy alterations within the framework of the template of the cover. 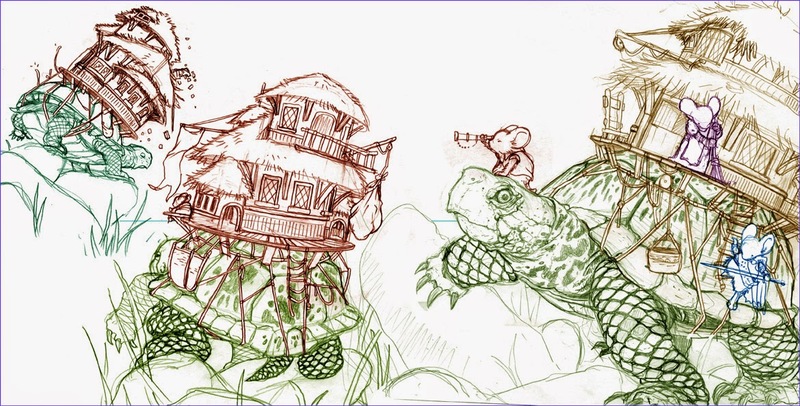 I could rotate turtles or shift their house-loads, or re-size mice, or move entire turtle-house-mouse combos around on the cover until I found a layout I liked. The above digitally-assembled layout was printed out on several sheets of printer paper and then taped to the back of a sheet of Strathmore 300 series bristol. On my lightbox I was able to follow the layout image as a guide or instead of "pencils" as I inked. For inking, I use Copic SP Multiliners mostly a 0.3 & 0.7 nib. 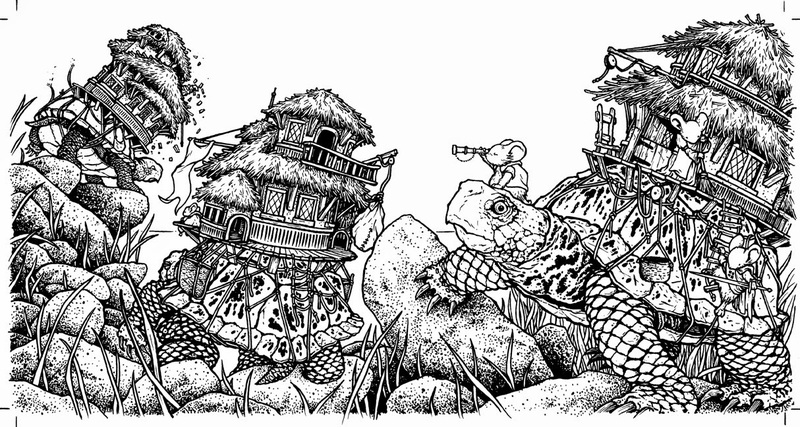 As always, I tried to get a varying amount of grey in the piece and used different textures to get there: stippled rocks, thatched roofs, and various turtle scale patterns. After the inks are scanned, the next step is to start the coloring process. This is refereed to as "flatting". 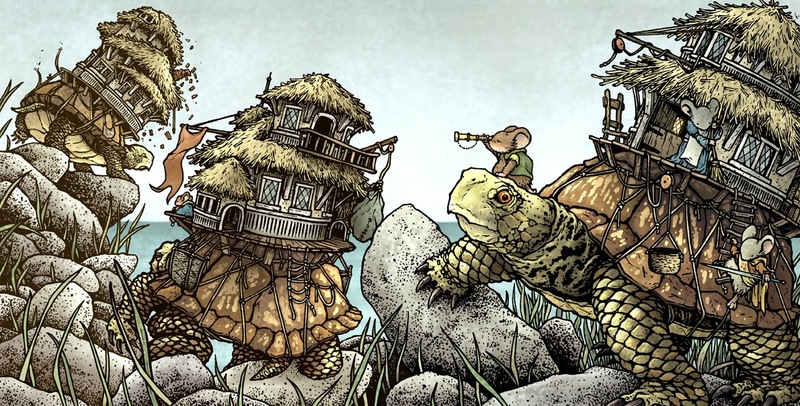 This is to establish major color areas as being different from one another (and in Photoshop I make these each new layers: Turtle skin, shells, rocks, walls, thatch, fur, clothes 1, clothes 2, etc.). These colors are rarely even close to the final image palette, but meant to serve as easy to read placeholders. The final step of coloring the cover is to make the final color choices, all the rendering (shadows and highlights) as well as to add any color holds (areas where I wish the inkwork to appear as color rather than black). I do all the rendering with the Dodge and Burn tools in photoshop and using a stock brush that adds texture and mottling as I work. I'm a big fan of Scott Kurz & Co.'s Table Titans web comic. Back in May, I did a piece of fan art purely because I enjoyed discovering the series. Well, the folks over at Table Titans are putting together their first printed collection and they wanted to use my past piece as a pin-up...but the versions of the cast I drew is from what will-be Volume 2. So I offered to not only let them use that piece when they were ready for Volume 2, but also to do a new piece for Volume 1. 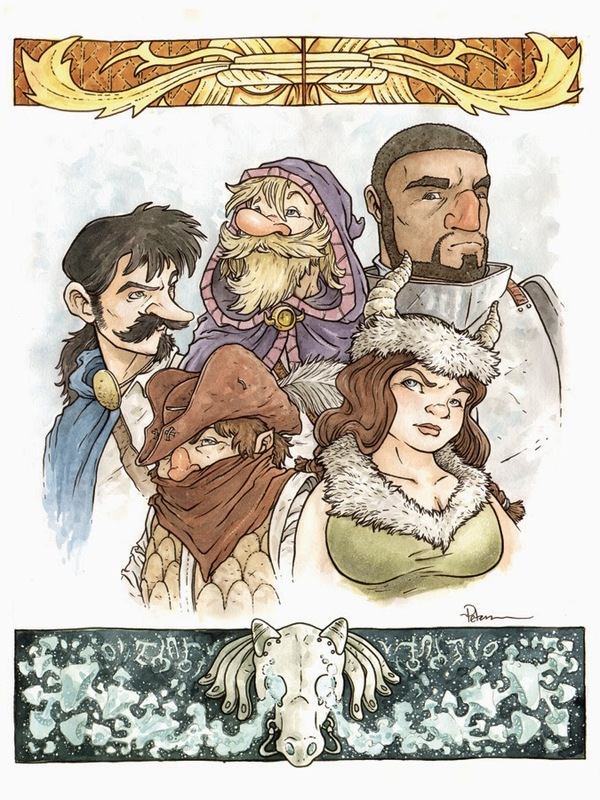 Table Titans is a comic about playing Dungeons & Dragons...but it's more than that, it's about a group of friends co-authoring a fantasy adventure together through the mechanics of an RPG system. We get to see the players interact, talk about their choices for their characters as well as seeing the fantasy story cinematically come to life. For this week's blogpost I'll show the process of making this new piece. 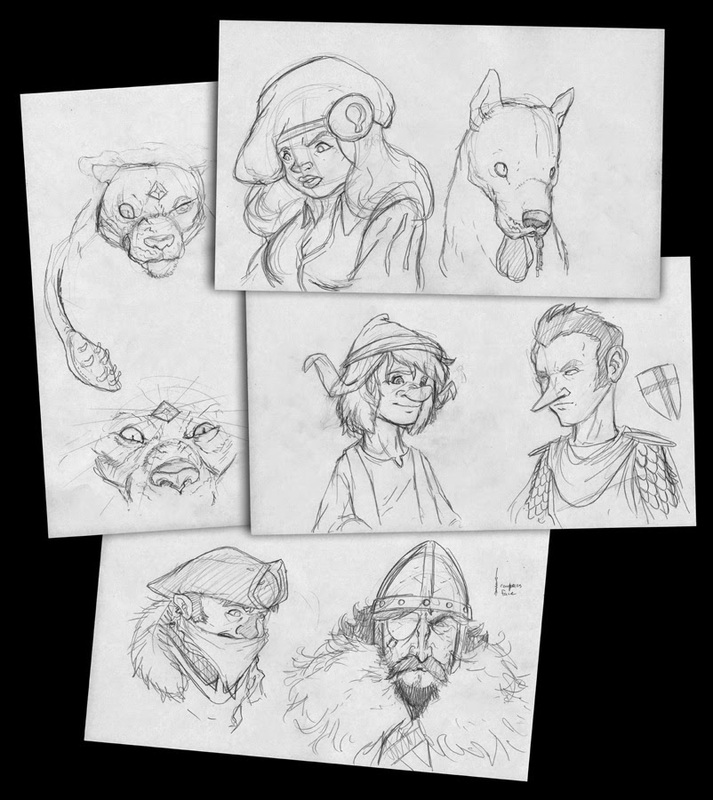 The roughs started out like the last piece, portraits of the characters in-game. In volume 1, the players are assigned pre-made characters, and so the costumes and roles are different than the piece I already had done. Darby's character Draziw the mage was just starting out and didn't have his robes and beard. Val, normally a barbarian was crushed to learn she'd be playing a bard. 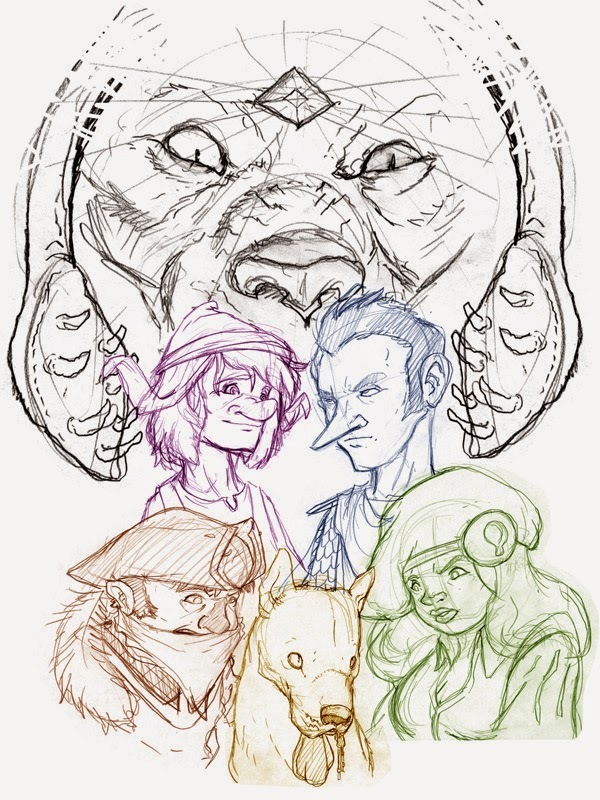 For the sketches I also drew some elements from the story to try and fit in like the displacer beast, the Caraway "eyepatch" the guardsman, and their adopted pet blink dog pup. I sketched these out on a few sheets of legal sized copy paper. I then scanned those sheets of sketches and started trying to arrange them into a composition I liked inside the format of the Volume 1 book page measurements. I tinted each character to help me distinguish them and make better sense of the layout. In this step I found that I had to lose Caraway, but my idea for the displacer beast to be a stylized looming set of eys, nose & jewel with the tentacles framing the composition was achived by playing with scale, rotation and mirroring of my sketches. I printed this layout composite and then taped it to the back of a sheet of Strathmore 300 series bristol. In a quick time on the lightbox I was able to copy the linework lightly in pencil so I could begin watercoloring the final artwork. I used a travel tray of Sakura watercolors (the 18 cake set) and slowly built up the layers of color (starting with the lightest tones first and working the darker areas with each revisit as areas dried). Once I had the painting where I wanted it, I went back in with Copic multiliners to ink the linework and add a bit of texture and detail. The last touch was to use a white gel pen and white correction fluid to add some texture and lighting detail over top of the watercolor and pen. BONUS! After finding out the page format of these volumes, I went back and added a few story element borders to my original Table Titans piece so that if Scott & crew would like to use it in their eventual physical release of Volume 2, my art would fit the page dimensions properly. The borders were done the same way as the pieces: sketch, digital manipulation, printout, lightbox pencils, watercolor, and then ink.